Indians from U.S.-Mexico borderlands are among 29 North American tribes added to our database this month. Pictured is Citlalli Salazar, an 18-year-old female ethnographic artist from the Kumeyaay Tribes of Southern California. 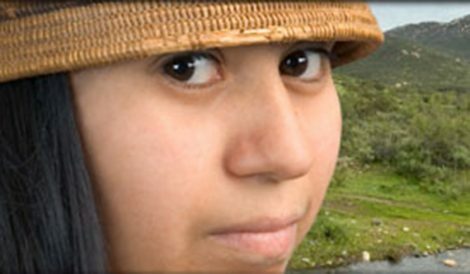 Insufficient data on Native Americans has long hampered both geneticists and genealogists. 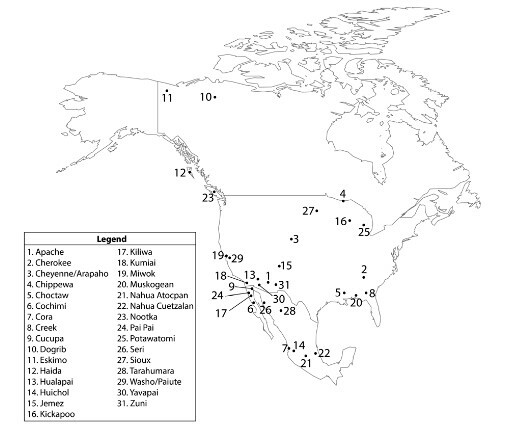 Finally, a major study has addressed this failing with 29 separate American Indian tribes and an overall North American sample containing a total of 533 individuals and representing a diverse gene pool of about 1,000 alleles (variants). DNA Consultants added the new data to its forensic matching database on July 27, 2018, more than doubling its Native American populations. Locations of the new tribes are shown in the map below. There are now 492 populations in the company’s database, all of them taken from studies published in journals like Forensic Science International since 1995, when the “CoDIS” standard for identity testing was introduced by the FBI. DNA Consultants has been one of the leaders in applying identity testing to ancestry. Its flagship product is the DNA Fingerprint Plus. For a blog post on the significance of the new Cherokee data see Enrolled Cherokee Genetics. Customers wishing to see how their DNA profile potentially matches with all current Native American populations, chiefly Cherokee, can purchase either a Cherokee DNA Upgrade ($50.00) or Native American version of the Premium Upgrade ($199.00). Existing customers receive a 10% discount. Those who are just starting out with DNA Consultants can order either the Cherokee DNA Test or Native American DNA Fingerprint Plus. S. Kanthaswamy et al, “Native American Population Data Based on the Globalfiler Autosomal STR loci,” Forensic Science International: Genetics 24 (2016):e12-e13.